Now that we have built your dream garden, or you may already have your perfect outdoor space, it is time to think about maintaining it. This is where Bosworth’s Garden Care teams can help you. Whatever the reason, whatever the season we are here for you. If you are struggling to keep the garden maintained, don’t have the time or are simply busy with life, then we have a solution for you. 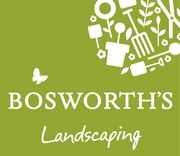 From a once off tidy to a regular maintenance package Bosworth’s Garden Care provides all the necessary equipment and “person power” to keep your outside space in tip top condition.